The moment when the happy couple emerge from the church to be bombarded with colourful sparkly shreds of paper is one of the most anticipated of a wedding – but where did such a bizarre tradition originate? Why do we throw pieces of paper, petals or rice to celebrate a marriage? And why – most bizarrely of all – does its name mean something quite different in the original Italian? The word ‘confetti’ is used in both English and French to mean the stuff thrown at weddings, but comes from the Italian word meaning ‘confectionary’. When Italians refer to confetti, they mean sweets such as sugared almonds or candied fruit, which are given out on special occasions. So what do the Italians call those little bits of paper? Their word is ‘coriandoli’ – which may have something to do with the fact that when paper and sugar were scarce in wartime, coated coriander seeds were thrown at celebrations instead. The whole tradition of throwing confetti can be traced back to pagan times, when newlyweds had grain thrown over them in the hope their marriage would be as fruitful as the seeds. It’s also a way of showing the couple that you want to ‘shower’ them with blessings in their new life together. If someone said ‘confetti’ to you, the first thing you’d think of would be those tiny bits of paper. Shredded paper, plastic or material is the most common kind of confetti, and comes in an infinite variety of styles and colours – from basic circles to metallic or glittery shapes celebrating every occasion. The Italians aren’t the only ones to whom ‘confetti’ means food. Rice, grain and nuts of various types can also be thrown over the happy couple. However, safety issues (it’s quite painful to get hit by a barrage of nuts) and fears for animal welfare have made these decline in popularity. A note for animal lovers; the warning about uncooked rice being lethal to birds is an urban myth. Several species of birds eat rice in the wild, and while it’s probably not their first choice of food, it certainly won’t kill them. Still, you can always be ultra-kind to your feathered friends by throwing bird seed instead. As concern for the environment grows, natural confetti in the form of flower petals has become a popular choice. 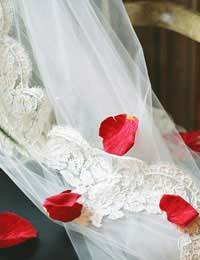 Fresh or dried rose petals are probably the most popular form, but any blend of flowers can be used. For smaller flowers, the dried heads can be thrown whole instead. You can even throw dried leaves at autumn weddings. Another gorgeous and organic idea is to throw scented confetti, such as dried lavender petals or fresh herb leaves. Many herbs also have a special significance in the lexicon of flowers – appropriate choices include lavender (devotion), basil (love) and geraniums (happiness). The first thing to do is ensure your confetti’s placed in an appropriate container. Suppliers usually offer paper cones, which are light and easy to reach into while still protecting the stuff from blowing away. Avoid containers like shallow bowls and baskets outside the church. Beware – some venues have rules against throwing confetti because of the mess it makes and the environmental hazards. Check with your venue before you start handing stuff out. If you’re responsible for cleaning up after the throwing, use a leaf vacuum to remove all traces from the surrounding area. If your paper confetti’s falling limply at the newlyweds’ feet rather than showering down over their heads, you’re throwing it wrong. Don’t face the happy couple, as this gives you less throwing leverage. Instead, stand side on, fill both your hands with confetti and fling it sideways and upwards for maximum lift and distribution!